For a single crystal to be dyed, it must first be fractured. To achieve this, the method of "quench crackling" combines two types of treatment to improve or alter a stone's appearance. The first step requires the rapid heating and cooling of the stone to create fractures in its surface. The second step is the application of colored dye that is infused under pressure. 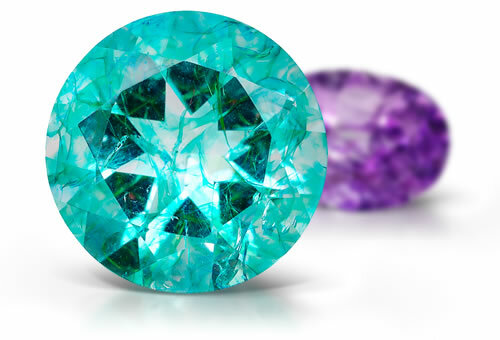 The dye seeps into the cracks of the crystal to distribute the color throughout the gem. Refractive index, appearance, birefringence, optic character and optic figure. A bull's-eye optic figure is determinative for quartz; may also show Airy's spiral optic figure and Brazil-law twinning under crossed polarizing filters. Spectra might show presence of Chromium in dyes. Stones are heated and then quenched in dye. Quench-crackled dyed quartz will have surface reaching fractures with dye concentrations often in a honeycomb pattern. The fractures will have an iridescent appearance.